Since purchase in October, I’ve put a lot of mileage on these puppies. They are quite flexible, well fitted to my long arched feet, and have a generous toe box. I did not see the value in the width of a toe box when I started running, but I soon learned after my first few black toes that a little breathing space does the tarsals good. These are by no means “minimalist” running shoes, but they nice and light for a structured shoe and I am able to feel the consistency of the ground pretty well. I did my first half marathon in my Asics (GEL-Nimbus 13), and while these shoes are great for kicking around town, going to Zumba, and even maintenance runs, I hurt pretty badly after wearing them for 13.1 miles. 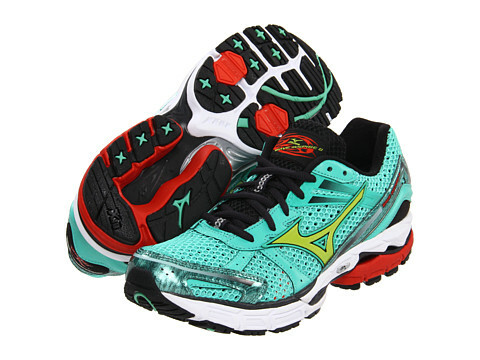 When I ran the Seattle half in my Mizunos, I experienced no shoe-related discomfort during the run, and I had minimal soreness the days following the race. Anyway, I have quite the affinity for my shoes. They are a part of me–we train together. I am pretty sure this is the way men from the South feel about their pickup trucks. Night run this evening. Hoping the current drizzle doesn’t become downpour later! I’m recently learning of the beauty of Mizuno. The Inspire has been recommended so I will definitely check those out when I’m due for my next pair of trainers. Where did you pick them up at? Trying to figure out who has the best selection of Mizunos in Seattle. Fairhaven Runners is the best bet for great selection and service up here in Bellingham. Not sure about Seattle, but i can only imagine that there are quite a few options!